When I worked at DRAG WORLD in 1965 and '66, a totally independent newspaper before it was sold to the AHRA, I would write a weekly column. This is reprinted from Feb. 4, 1966. And for you new kids, this was decades before the ballistic nylon blower diaper was invented. This was also back in the days when they would have more than 100 Top Fuel dragsters qualifying at Bakersfield, not like today's NHRA meets where they can't even come up with 16 cars to fill out the field. Sad but true. Now you know why we call 'em "The good old days." We were spoiled rotten with great drag racing in that era, but took it for granted at the time. And I'll never forget the sound of a blower going "WHOOF," with the following silence being broken by the shower and tinkle of chunks of aluminum hitting the ground around you. The Spring Tour plays host to over 150 AA fuel dragsters, and competition, to say the least, will be keen. Qualifying at these big meets is really a chore simply because of the multitude of rails trying to squeeze into a few available qualifying slots. The key word is "lean it." That is often the ragged-edge road to qualifying. Unfortunately, a lean condition can have disastrous results, and because of the tough competition in qualifying and actual racing, we again welcome that glorious 31-day period known as "National Blower Explosion Month." For those of you unfortunates who have never seen a real quality blower explosion, which usually occurs in the traps, words simply cannot describe the awesome grandeur depicted by a set of injectors being catapulted to the moon, or half a GMC rotor bouncing gaily down the strip. Mind you, I'm not speaking of a mere cracking of the blower case, but rather a full fledged explosion, with that glorious showering of Van Hamptymann parts. Actually this famed month kicks off the early contest in which all blower explosions are rated, tallied and totaled, and the 1966 champion is crowned. Starting and ending dates center around the UDRA meet, since that is an unbiased (association-wise) milepost. 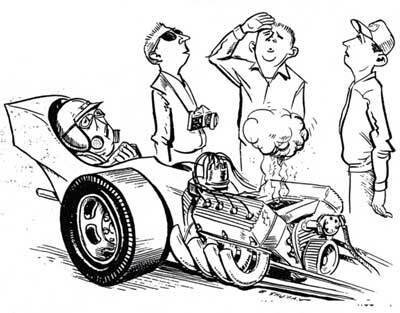 Exactly who was the first fuel racer to inaugurate the precedent of total destruction of the blower case has been swallowed up into obscurity, but one of the first recorded incidents of greatness occurred when Art Chrisman blew his crank driven front mount while racing Garlits. This notoriety was achieved because not only the case disintegrated but the ducting was turned into instant shrapnel and flew for a reported 100 feet. Another 1959 breakthrough came when Jim Miles lost the puffer on his '34 Ford coupe, lifting the hood some 150 feet in the air, with the blower under it. Some maintain that the altitude record must go to the team of Stellings and Hampshire for their Bakersfield effort which was applauded by the experts as really "a good one." Sid Waterman achieved immortality when Modern Rod Magazine featured a color cover shot of his car immersed in a ball of flame resulting from a popped blower. And then there was the time the Chrisman-Cannon "Hustler" popped a blower, with an accompanying "shoestring" catch, as the blower was found nestled between the drag link and the body of the car. One must understand that a truly great blower explosion is not the easiest thing to accomplish, as those who can't make the grade often blow the bottom out of their blower manifold without even twitching the actual case. Others, like Art Malone, tried to achieve blower explosion greatness but only sneezed them, resulting in a case separation but no altitude. Yabsley and Mitchell are trying their best to earn a spot in the Hall of Fame. They have lost a blower four weeks in a row. Unfortunately, they can't seem to get any further than simply cracking the case. Keep working at it -- as everyone is behind you boys. With the sport of drag racing developing at a rapid pace, it is time that an accurate and handy scoring system for rating blower explosions was established. After many long hours of research by a competent panel delegated the task of founding a system for rating, the following stipulations for points scoring has been established. Before getting into exact point scoring, a few introductory remarks are needed. The committee felt that the difference between day and night explosions had such different effects that a daytime and night-time rating system should be set up, as night explosions, where the vivid flames are easily distinguishable, are naturally more spectacular than the day occurrences. This puts the two categories on a par without competing against themselves, where night explosions have a definite advantage. The first prerequisite in a high scoring explosion is that the blower case is completely severed and leaves the car. This, as opposed to a mere cracking of the blower case or separation of the blower on the car, slightly akimbo atop the manifold, is definitely the first step toward a record attempt. NOTE: There are a few cases where the points scoring system can be canceled or doubled, depending upon the situation. If any serious injuries are incurred by either the driver or spectators, all points are nullified, regardless of how spectacular the explosion was. If the car which experiences an explosion is either sponsored by or campaigned by a professional blower re-worker, the points score is immediately doubled. If the explosion is featured in a magazine or newspaper with photographs, it is an automatic double point score. If it received a color magazine cover, it is a triple points score. It is recommended that all blower explosions be planned to occur at points where the maximum number of fans-racers-judges can witness the spectacle for a highest rating. Examples are for day racing, the traps adjacent to the pits at Irwindale, or for night racing, the traps adjacent to the push-out road at Lions. Although the Universal Blower Explosion Official Scoring System was not in effect during last year, the selected panel of judges has singled out a few of the really great explosions of 1965. The Santa Monica "Surfers", Skinner-Jobe & Sorokin, receive the award for the "Loudest Explosion of 1965" for their recent blast at Irwindale. Marvin Schwartz relieves the "Agility Award" for getting hit in the head by an exploding blower case back East. The Northern California "Vagabonds" get the 1965 "Longest Burning" for their fine exhibition at San Fernando. Gotelli & Thode receive plaudits for the "All Around Good Explosion of 1965" at Irwindale. The "Outstanding Explosion of 1965" Award goes to the team of Alberts-Childs & Toler for their sensational performance at a local track. Scoring highly on originality points, the team racked up a high point score when Jim Alberts leaned over the motor to check it in the staging area just before a run. When he "wapped" the throttle linkage on the "Addict," the blower let go, slamming him up against the fence. Because the incident occurred right in front of the spectators,and in clear view of the judges, the event was noted as perhaps the best blow of '65. Unfortunately, the blower case did not disintegrate into numerous fragments and none of the parts flew into the adjacent grandstands, robbing the team of an all-time high points score. However, the raw nitro which squirted out all over track was luckily ignited, resulting in a fire. Judges noted that the flames seemed to change color beautifully when the fire extinguishers were applied. Congratulations to Alberts-Childs & Toler for the "Outstanding Explosion of 1965" Award. Without a doubt, the unanimous choice of the judges for the "Best Explosion in the History of the Sport" goes to the team of Brisette & Alexander for their sensational performance a few years ago at Riverside. The amazing this is that this was a daytime explosion and was not aided by the naturally high scoring effect of flames at night. Not only did the car lose the blower in its entirety, but one piece of shrapnel hit the opponents's car (Herbert & Tapia), and another piece was lodged in the Champion Spark Plug sign on the overhead bridge above the traps. 02.13.08 - "I just read the story by Terry Cook about "National Blower Explosion Month". Believe me when I tell you this is the first time I have ever seen this article. I say that because in 1982 at Indy I wrote up a scoring system that in many ways is identical to Terry's. Mine was more extensive, in that it covered oil downs and and other calamities as well. If you recall 1982 was when everybody was messing with Nitrous and other "enhancers" and stuff was getting blown up left and right. On his way to his absurd 5.63, the Snake left 3 motors laying on the ground. Anyway, practically every pair brought another oildown. I was down by the Safety Safari truck at turnoff 2 with Cameron Evans and Scott Forthmann, who ran the contingency midway for NHRA for many years. We had to figure out some way to kill the time from all these oildowns so I sat down with a piece of paper and started jotting down notes. I remember the potential high score being something like "oiling down both lanes from starting line to finish line, culminating in an engine explosion that hit the other car with parts." Same as with Terry, if anybody got hurt it was immediate disqualification. Oh how I wish I could find the score sheet. Probably in the same place as all my old (very valuable) baseball cards. One other memory of the score keeping. I was sitting in the finish line stands at Fremont during Funny Car keeping score. We're laughing at a score we gave when from behind I hear this "Little Mac, what in the e hell are you doing?" I turn around, and it's Frank Bradley. I'm thinking I'm done for, so I show it to him and starts laughing for about 20 minutes straight. Must be since I didn't show him his score. As I get older, I think about how much fun it was growing up at the drag races. Thanks for sharing all of these memories.